Let's face it: the polar vortex has wreaked havoc on our hair, lips, skin, and over-all well being. I'm so ready for this winter weather to be over with! My dry itchy skin is in desperate need of a little TLC, so when I received the Moroccan Infusion Body Lotion and Dry Body Oil from my friends at Suave Professionals, I almost cried of happiness. For the first time, Suave body care is launching products in the Suave Professionals line, offering women everywhere access to premium quality products with the finest skincare ingredients. Suave Professionals Moroccan Infusion features authentic argan oil from Morocco, a lightweight miracle oil known to be rich in nutrients and antioxidants. The new premium range leaves skin looking and feeling beautifully silky and radiant. The body lotion is my new favorite daily moisturizer. It does a great job of hydrating my skin and smells exotically fresh! The dry body oil also absorbs quickly, is long-lasting, and is perfect when you want to add a little more shine to your skin. Now you can love these products as much as I do! 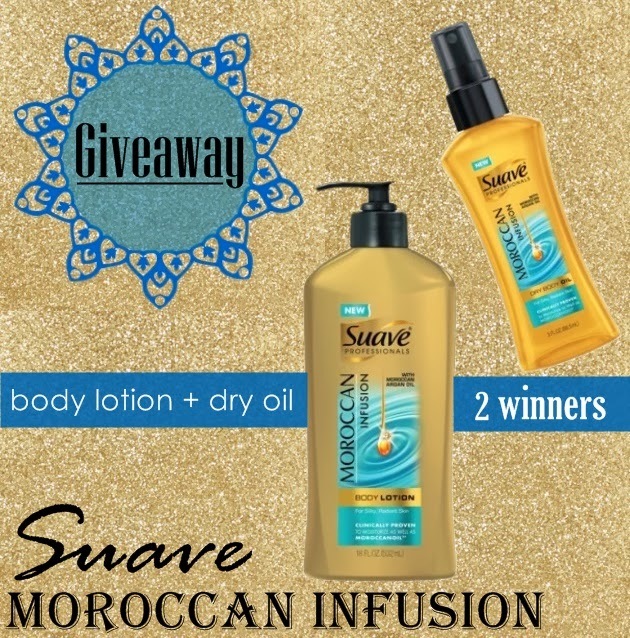 Suave is offering two of my readers the Moroccan Infusion Body Lotion and Dry Body Oil!! To enter to win simply follow the instructions on the widget below. Good luck! If you want even more chances to win, enter the Suave Radiant Wishes Sweepstakes! By using #RadiantWishes on Twitter or Instagram, fans are entered for a chance to win new Suave Professionals Moroccan Infusion Body Care products, and a spa day or trip to Los Angeles. Enter here. We've had the worst winter ever. I'd love to have something to even out my skin. My skin is soo dry from this cold winter. I would love to win this!! i need this because the winter has done a number on my skin!! Wow these is super cool. I would love to win this! My skin is sooo dry!! This winter is wreaking havoc! I hate winter and so does my skin! My skin is so dry from the winter. This would be such a luxury! The skin on my hands is so dry, they crack and bleed. So, this would be nice. My skin is suffering from this wicked Winter weather. I am in such a desperate need of a spruce-up, my hair is lame! Its winter so my skin is extra dry right now. My skin is the driest it's ever been in my life! I need this because my skin is dry and scaly in spots. I've got that dry winter alligator skin going on thanks to being trapped inside with the heat on day and night! My skin has taken a beating this winter, i need to win this to get it back to smooth. My wife would love this, she loves suave products. I want to win this because my skin is dry and needs some nurturing! My winter skin needs this to be healthy! Dry skin. Like sandpaper meets saltine cracker dry! i have really dry skin. this would help so much! This would really help my dry skin from all of this crazy winter weather! i need this because i have dry hands from working outside all the time! I need this to help my winter skin! My poor, dry skin needs to try out these incredible products!! I need this because my hair needs some serious help! ok ok so im going to be honest here, I have the moroccan oil and OhEmGee it's amazing stuff. I use it every day and especially after I straighten my hair. Well, I'm about to run low >_< so I would totally love to win it so I can have it when I run out in about less than 2 weeks I'm trying to not use it all, but I can't resist the amazing smell and the soft hair on a daily basis. I need this because my skin is dry and flaky. My skin is extremely dry during the winter months and could use a little TLC and I have heard great things about this line from Suave. I already use their Moroccan line for hair and I love it! My skin has been the dryest this winter than it has ever been before! i've been getting stretch marks everywhere just the last two months, i'd really like to try something different and help stop these. My skin needs some love since this terrible cold winter.